Wow! Yesterday, we made our first bar of soap. How is everyone doing? Did you have any problems? Are you ready for your next batch? I think I am! Come join me for another batch of soap! Today I thought we would keep all of our oils the same except for one. I wanted to show you that changing just one oil in your formulation can change your bar. 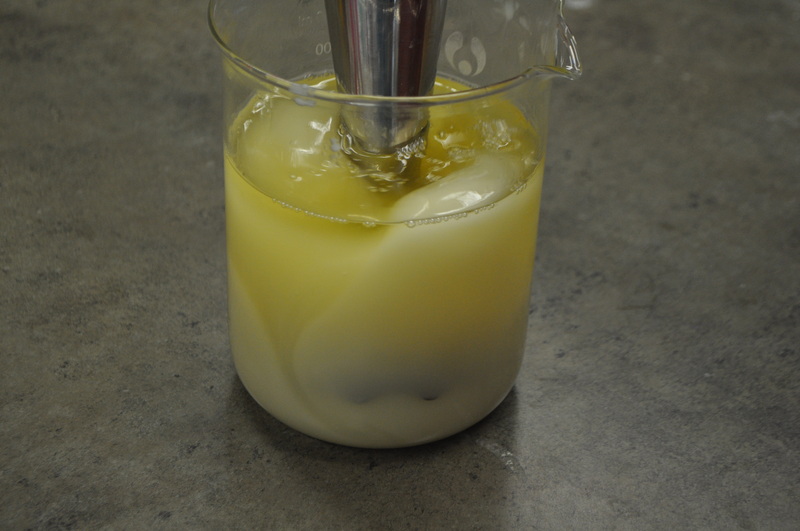 Today we will be using Tallow instead of Hydrogenated Soybean Oil. 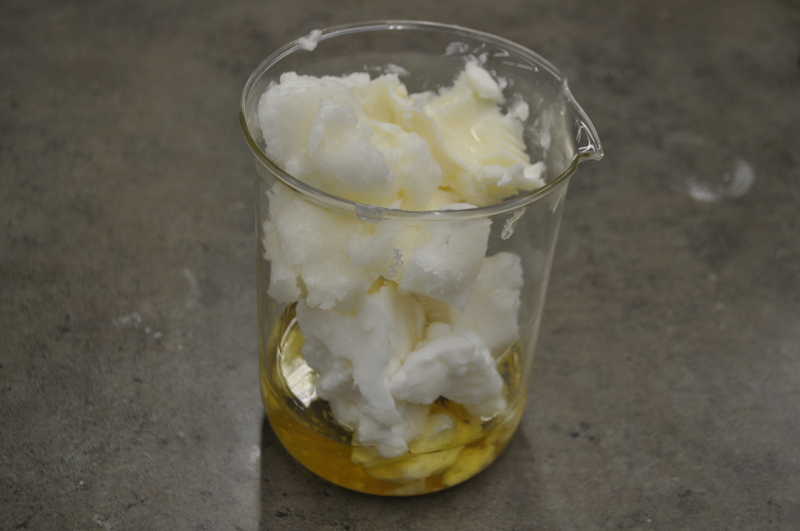 Tallow is a solid oil that comes from the body fat and suet of cattle. Other animals that are processed for meat also offer tallow, but their names are used to make the source clear, deer tallow, sheep tallow, etc. It is solid at room temperature and can be stored in an airtight container without needing to be refrigerated. 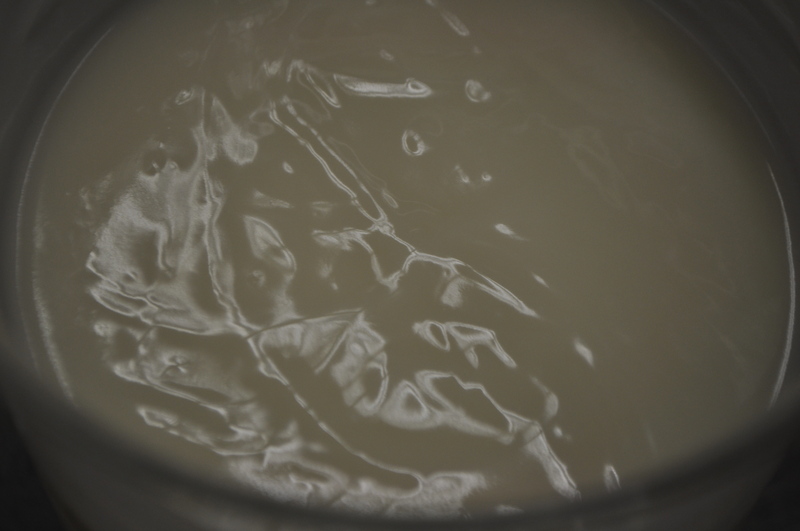 Tallow makes a hard but not brittle bar. Tallow has long been used because it is from the fat that comes from butchering an animal for meat. Tallow was more easily available and people were able to collect all enough for the things they would use tallow for. Some of these thing include candles, soaps or even as a lubricant for guns. Except for the tallow, our recipe is the same as yesterday’s. Let’s go make some soap! Weigh the oils into a microwave safe container. Place into the microwave and heat. While the oils are heating, weigh the lye. Slowly add the lye to your container of water. DO NOT add water to your container of lye. The two chemicals reacting can cause a dangerous volcano. It is best to create good safety habits now, before you make a batch of soap that is 20 lbs in size. For most soaps, you will want to mix your oils and lye solution when both are somewhere between 110°F to 130°F. We recommend having your oils and lye solution within 10°F of each other. In the winter when your soaping area is cooler, you will want to soap at higher temperatures. In the summer when your soaping area is warmer, you will want to soap at cooler temperatures. For this particular batch my oils were 130°F and my lye solution was 124°F. When your lye solution and oils are within the ideal temperature range, slowly pour the lye solution into the oils. 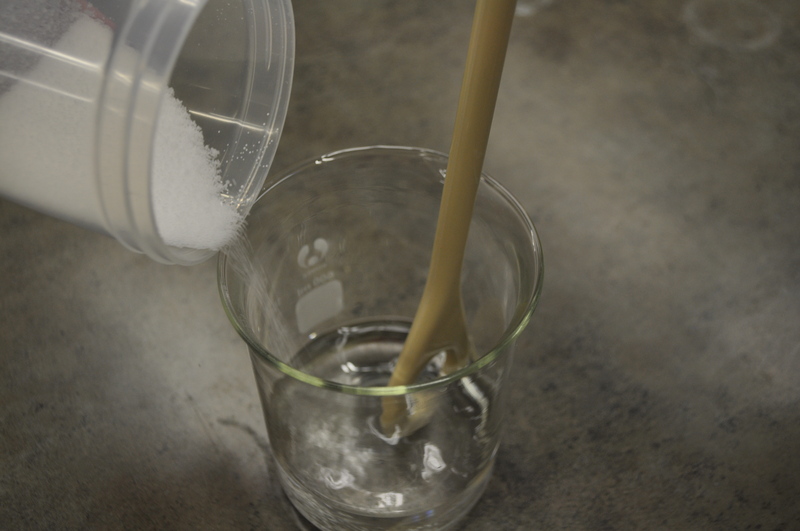 Using either an immersion or a soap spoon, mix until you reach trace. 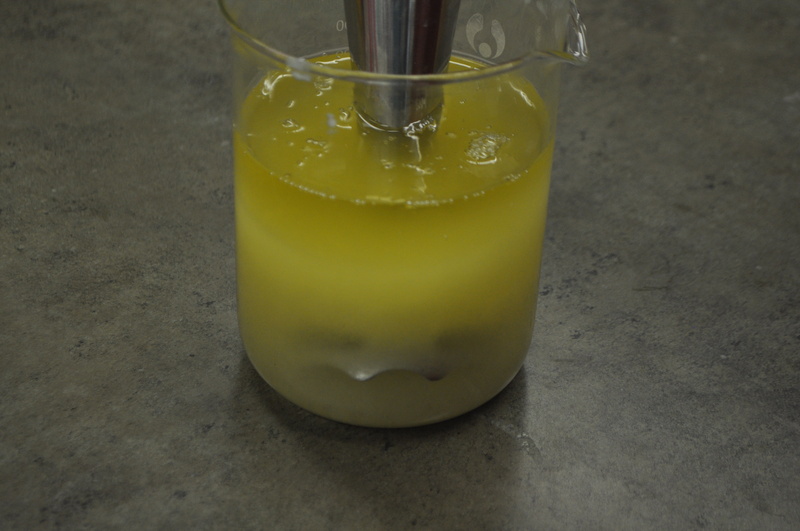 Trace is when the raw soap has been mixed enough that oil will no longer rise to the surface when mixing has stopped. If you aren’t sure if you have achieved trace then stop mixing, go get a glass, fill it with water, do not drink it. Come back to your soap. Is oil floating on the surface? 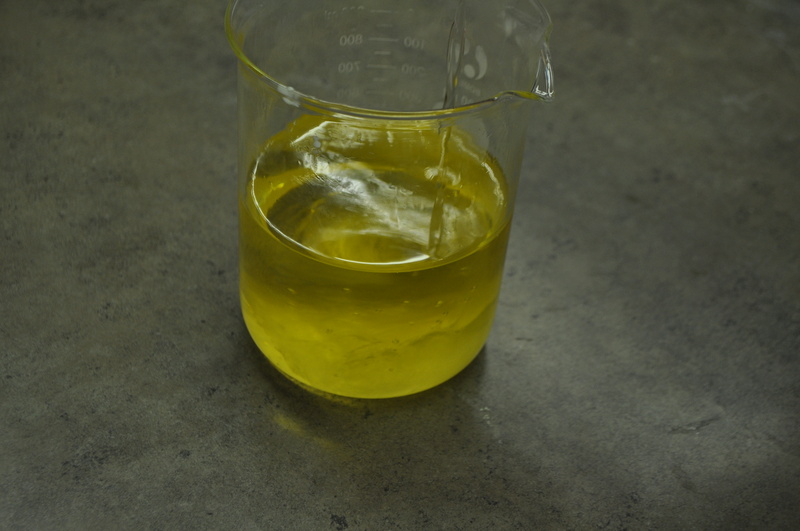 This short distraction will allow unmixed oil to rise to the surface. Once trace is reached you can pour the soap into a mold. Allow the soap to sit undisturbed for 12-24 hours. 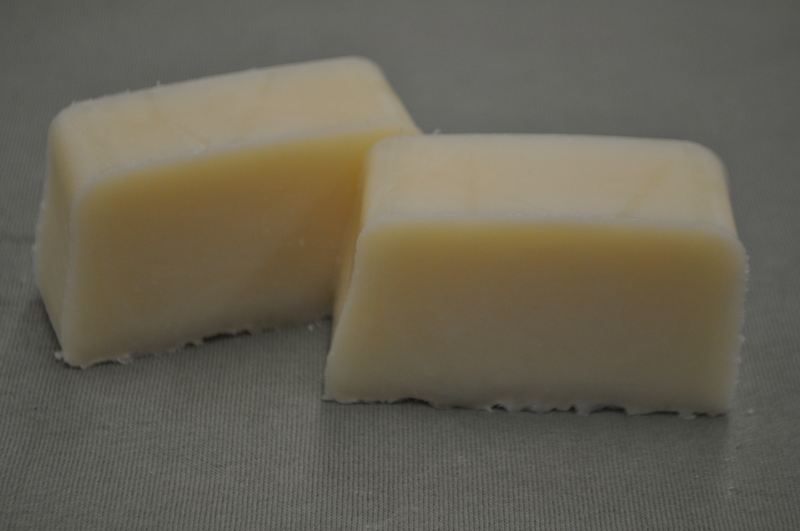 After the soap has been allowed to sit for up to 24 hours, you can unmold the soap and cut it. Arrange the cut bars of soap in an area where there is good air flow but where they will not be in the way. I like to put them on a sheet of cardboard. You are now ready for the curing process. The curing process is just allow the soap to dry out, giving you a nice hard bar. You can use your soap immediately after cutting but it will not last as long as a fully cured bar. Thank you! I’m loving this tutorial. Especially the 6-5-4-1, so much easier to deal with than percentages. And easy to increase for a bigger batch Mine is going to be 6-palm 5-coconut 4-canola and 1 sunflower and/or lanolin.